If you're a modder who demands the most efficient cooling inside your PC, the Xilence 92mm Red Wing Case Fan w/ PWM Technology is a perfect way to kick your machine into high gear. 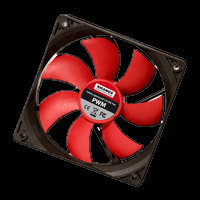 Sure to deliver optimum performance, this 92mm fan from Xilence is built to seriously cool down your current system while providing an extremely low noise level. Thanks to it's impressive pulse width modulation (PWM), the fan can run at the speed necessary for different temperature levels. This will allow your PC to run quicker at high temperatures and slower when the temperatures are low.